"I was a very outgoing guy before, but after I became embroiled in this vicious circle, I became gloomy. I couldn't make myself interested in anything, not my work, friends or family," the 26-year-old man surnamed Wu said. "Every day was tough." Wu was talking about his experience with AIDS phobia. Not to be confused with AIDS itself, AIDS phobia is the irrational belief that one has AIDS even though medical professionals have ruled it out. It is also manifested in the belief that one is destined to catch AIDS. One evening in May, Wu had a one-night stand with a colleague after getting drunk. Despite wearing a condom, after he woke up, he grew anxious and began to believe he had contracted AIDS/HIV. Since then, Wu has had several tests from different hospitals, but the results all came back negative. "I grew up in the shadow of a hospital, in a family of physicians. Since I was very young, sometimes I would hear from them that patients must do AIDS/HIV detection tests before surgery to avoid infecting the doctors," said Wu. "There are several different ways of thinking about AIDS phobia, or as it is sometimes referred to particularly in China as AIDS panic, or kongai zu. Basically these are people who are excessively anxious that they have already caught AIDS or that they might catch it so they do things which interfere with their lives like excessive demands for AIDS testing (despite repeated negative findings) or excessive avoidance of people and places where in fact that avoidance doesn't bring about any extra safety from AIDS and is irrational," Dr. Raj Persaud, a consultant psychiatrist in Harley Street, London and emeritus visiting Gresham Professor for Public Understanding of Psychiatry, told Metropolitan by e-mail. Experts interviewed by Metropolitan all said that there were many factors behind the phenomenon of AIDS phobia, and highlighted public ignorance of the ways AIDS/HIV is transmitted. They also pointed out that the discrimination and social stigma facing AIDS patients are contributing factors. While therapy can help remove this phobia, the dearth of professional psychologists who are familiar with both basic medicine and psychology is contributing to the problem, according to experts. Despite being given a clean bill of health, Wu feels he is trapped and he cannot tell anyone. "It is unlike hepatitis or diabetes. If you get AIDS, people will think that you must have done some dirty sexual practice, something that tarnishes your character. I would rather end my life in a car accident than let my family feel that shame," said Wu, who once thought about suicide, fearing that his imagined condition would cause humiliation for his family. This July, Wu stumbled onto an organization called the Chengdu Fear of AIDS Intervention Center (CFAIC), in Sichuan Province. He joined a QQ group for AIDS-phobic people, which has over 1,100 members. After several counseling sessions with Zhang Ke, psychological counselor and the head of the center over a period of more than one month, Wu's fears were gradually eased. "As a student majoring in the sciences, I need scientific analysis and logical reasoning to persuade myself. After the analysis, I began to calm down and realized that I do not need to panic over it because I evidently had not caught AIDS/HIV," said Wu. 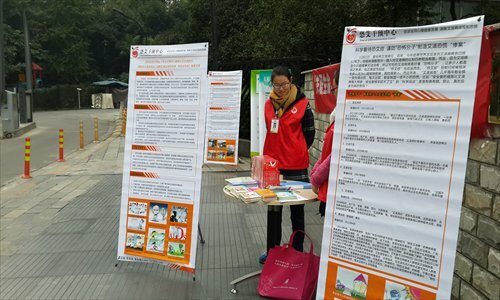 Since it was founded in 2009 as an NGO providing psychological assistance to AIDS-phobic people, CFAIC has provided psychological assistance to over 6,000 people, according to Zhang. "There are no statistics on the specific number [of AIDS-phobic people] in China, but it has had massive growth according to our statistics," said Zhang, adding that among all the respondents, men accounted for around 60 percent, and most were aged between 19 to 29 years old. Zhang said that Wu's case demonstrated a number of factors that are common among AIDS-phobic people. They are typically afraid that they will be discriminated against and tend to demonize AIDS/HIV sufferers due to misunderstandings. For example, a lot of people incorrectly think that they can catch it from just shaking hands with people who might have AIDS. "I think the social stigma about AIDS is the major reason. In foreign countries, there are not so many people suffering from this phobia because they consider it to be a normal infectious disease [and understand its limitations], but AIDS is exaggerated in China," said Zhao Xudong, director of the Department of Psychosomatic Medicine and Psychiatry at the Shanghai East Hospital. "People have attached certain cultural biases to this disease and link AIDS patients with negative associations." Persaud also pointed out that one theory states that China's media and government are worried about AIDS, so have pushed a lot of stories about the subject, which has distorted people's awareness of the likelihood of catching AIDS. Persaud said, relatively speaking, hepatitis and tuberculosis are much bigger problems in China in terms of the number of people affected. But the media coverage on the two diseases is dwarfed by that of AIDS. The Chinese public seems to be unaware that they are at a greater risk of contracting the two diseases compared to AIDS, Persaud suggested. Zhao noted that people should not panic over the outbreak of AIDS phobia. "The situation is much better compared with the 1990s. Now more people have a rational attitude toward AIDS. There just needs to be a process to reduce discrimination, just like the acceptance of hepatitis." Zhao also pointed out that there are also phobias about other health conditions, with those suffering from AIDS phobia comprising roughly 10 percent of the total number of people with health-related phobias. Li Qiang (pseudonym), a man in his 20s, has been living in "darkness" due to fear of AIDS/HIV since last August, when he engaged in activities which he thinks might have made him susceptible to contracting AIDS, though he refused to give details about what those activities were. Now he is even fearful of the words "hospital" and "drawing blood." "Especially when I am alone, when night falls or the days become colder, I am gloomy all day, feeling that there is no hope," said Li, who now tries to avoid work or socializing with friends. Afraid of telling anyone, Li instead tried to find advice on online message boards, but if anything, they reinforced his fears and prejudices. "Now my only concern is whether the testing method used on me is scientific or not, after I saw a piece of news saying that it is not accurate. If there is no problem with the testing method, then I will be relieved of the phobia," said Li. Zhang pointed out how extreme the problem can be. "AIDS phobia can have a severe impact on the sufferers. It can influence their work and personal lives, and some will find their personalities suddenly change. Some even hallucinated about bleeding profusely from injections." Li underwent psychological counseling twice this year, and was momentarily relieved after talking with the doctors. But several days after the therapy, he returned to his depressed state. "Those who have not engaged in activities that put them at a higher risk of contracting AIDS find it easier to recover after some misunderstandings are corrected," Zhao said. "But for the smaller group who have participated in high risk behaviors, the symptoms can be recurrent." "Having the symptoms return is normal, but we still think this can be cured," said Zhang. "Cognitive therapy is the most commonly recommended course, which can give them personalized intervention based on their own personality and environment. If they have severe mental disorders, we will transfer them to psychiatrists." Zhang also noted online sources can often be inaccurate, and cross-counseling using online and offline sources can cause conflicting answers and increase their anxiety. "Also, try to distract your attention rather than falling into the inertia of focusing on the website. Finally, you must trust in your counselor once you choose one." After a recent counseling session, Li still decided to have another test. "I don't know where I can get help from," he said, adding that very few medical resources are available. "I once posted a Weibo message saying that I was fed up with the phobic people who came to me for help. One even called me at midnight. I told them not to panic, but they do not believe me," said Liu Yunlong, who was infected with HIV in 2006. "Mental therapy for AIDS phobia is an interdisciplinary subject which demands both preventative medicine and also psychology. But professionals with these two backgrounds are rare," said Zhang. Wu is now a volunteer with CFAIC. "After recovering from AIDS phobia, I got better and have a more rational understanding of it and I know what phobic people are really afraid of. So after receiving training, I want to provide help for these people, who have limited options for treatment," Wu said.